We offer highly reliable, industrial-strength, ready to use professional software components building blocks, delivered with full source code and professional support. Our components are not toys or approximations. They were precision-designed, built and tested by highly skilled individuals and come will full professional support. They were all tested for memory leaks and robustness over millions of operations and their cost is only a fraction of what it would take to architect, design, engineer, test and debug comparable solutions. Consulting and integration services are also available if desired. We can put our 25 years of extensive development experience at your service! Highly scalable 32 & 64-bit reliable local folder watcher (aka "hot folder") component that really works, suitable for folder monitoring in client or server environments under any load. Uses advanced programming techniques to achieve utmost reliability: it never, ever misses a file arrival, even under extreme machine load and even in very busy multi-processing / multi-core server environments. The component can be used as a C++ class and linked directly into an application or server, or as a free-threaded COM component called from C/C++, C#, VB.NET, VB or any COM-capable client or .NET-based language. It would be easy to create a wrapper DLL with a classic C-callable API to use the component from virtually any development environment or language. There are plenty of sample code on the internet that shows how to watch folders from native or managed code. Those all work well under light load but are not 100% reliable. Just Google FileSystemWatcher missing events to get an idea. Also the "hot start" scenario is never addressed, where your processus starts (or is restarted) on a non-empty folder (or folder tree) with thousands or tens of thousand files that must be scanned to grab existing files and monitored at the same time for new incoming files, and where you cannot afford to either miss a file, grab it out of chronological order, or grab it twice. This happens all the time in real production scenarios. The original version of this component has been used since 1999 (and still is) on industrial systems in the internet photo printing industry, processing hundreds of millions of files per year, without ever skipping a beat. The component has been fully leak-checked - it can run for an indefinitely long time - and is ready for deployment in 7/24/365 systems. It has a dynamic internal structure that allows it to fetch and queue hundreds of thousands of events, only limited by available memory. Events can be read by any number of concurrent threads in a perfectly synchronized and chronological fashion. If you are looking for a hot folder component for the next "desktop folder synchronization utility", this product probably is not for you. If, on the other hand, you are wondering about how to solve those elusive and entirely irreproducible bugs in your mission-critical hot folder-based system, like files left behind for no apparent reasons, you have come to the right place! This component can be seen in action in FastPictureViewer, a desktop image viewer where is it used to track folder content on local drives. Highly scalable persistent cache component, able to handle millions of prioritized [Serializable] objects of mostly any kind, ranging from a few bytes to a few hundreds KB. The cache supports multiple scavenging strategies, events, 20+ performance counters, quotas (total objects or total size) and more. Transactional object storage survives computer crashes without special maintenance. Exposes its services remotely through .NET Remoting. Highly scalable dynamic storage manager with multiple allocation strategies. Aggregates multiple storage locations (local or remote volumes) into a hierarchic storage pool of potentially hundreds of terabytes. Clients make simple storage allocation requests, for example to allocate space for a file of a certain size, with certain criteria such as required speed of access or type of storage location, and the Storage Manager picks the most appropriate physical location (storage point) to store the file and allocates space for it. Supports load balancing, round-robin and waterfall strategies, distributed storage (SAN), 9 performance counters per storage point to monitor their status. Initially designed for supporting a highly scalable image storage farm of millions of objects. Highly robust, internally implemented using finite state automata, able to handle hundreds of allocations per second. Exposes its services remotely through .NET Remoting. The component locator can be the backbone of a distributed system where software components find each other on the LAN by service type, for example a storage consumer could query the component locator for the location of a storage manager, or the location of a cache manager. Services can register and unregister dynamically from the Locator, each locator maintain a replicated database of running services and detects / maintain the state of the available services across the LAN along with each nodes load level. If a machine goes down the requests for the service(s) that were hosted on that machine will automatically be routed to another suitable computer. Conversely, if a new machine or service gets added, the Locator will automatically and dynamically integrate the newly added services and load-balance requests across all available services. 19 performance counters are provided to monitor the Locator service's operations. All components can be modified and adapted to suit particular needs, please write for more information. The components are licensed on a per project basis, regardless of the number of developers involved. They can be redistributed in compiled or linked form with your application but cannot be used as part of development frameworks, libraries or as part of competing products. The components and their source code are licensed, not sold. SwissDecTX Transmitter is a ready-to-use software component written in C# and C++ which performs the secure and encrypted data transfer required by SwissDec at a fraction of the cost and time it would take to develop your own conforming secure transmitter from scratch. Server replies are returned to the application as XML data. The signed and secure, fully compliant transmission of XML declarations is performed in just a few lines of code with SwissDecTX, making it extremely easy to conform to the strict requirements imposed. Call bindings are provided for COM (VB6, Delphi, C/C++, .NET 1.x, ...), .NET 2.0 or later (VB.NET, C#, ...) and a C-callable wrapper can be used to call the library from any language or environment able to call DLL function, e.g. PC SOFT's WinDev, C programs, etc. We can produce 64-bit versions of the components if necessary, contact us for details. We have customers using Progress, WinDev, VB, Access and Delphi so far, all using the exact same version of the transmitter. SwissDecTX makes it much easier for you to get the SwissDec certification, you can start sending fully-conformant signed and encrypted declarations in minutes instead of weeks or months. The library is available now for licensing in binary form. 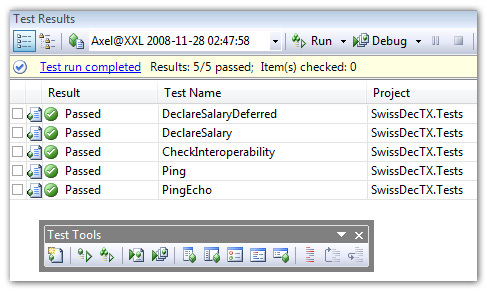 Here is a sample message corresponding to the reference file ICHAGCompany.xml (use the View Source command as IE has trouble with very long lines), and here is the corresponding reply and status, confirming that the server has accepted the declaration (despite that the sample data is outdated). System requirements: Windows 2000 or later, including Windows XP, Windows Server 2003, Windows Vista, Windows Server 2008 / 2008R2, Windows 7 and Windows 8 (desktop). The transmitter only depends on the .NET Framework 2.0: there is no pre-requisite to install on Windows Vista or later operating systems. Also, no need to install the (heavy) .NET Framework 3.x/4.x on Windows XP, and SwissDecTX still works on W2K if necessary! SwissDecTX is licensed per product and per company, there is no runtime royalties or redistribution fee, the cost is fixed and you simply license SwissDecTX once, for product X of company Z, that's it! Inexpensive yearly maintenance plans comprising all updates and extended support are available. Source code is also available under a separate license. Made in Geneva: email and phone support in French or English. We have extensive experience working with developers at all levels and developing libraries and software component building blocks. More than 18 software developers already got the full SwissDec certification of their salary product with our SwissDecTX transmitter since Sep 7, 2009. The SwissDecTX transmitter is a proven, reliable product and its runtime is now deployed and in production in hundreds of companies, collectively transmitting thousands of salary declarations every year. Ask your local SUVA expert: he certainly heard about this product and chances are that he certified one or more salary apps with our transmitter already! Check our PowerPoint and PDF presentation and PDF Integration Guide (in french), as well as a Help File (CHM - you must save this file to your computer and unlock it, as it will not open in or from a web browser). SwissDecTX is a hassle-free, lightweight component: just add a small installer (about 1.5MB) to your application and that's it! Deployment on the end-user machine is entirely handled by the supplied installation routine. Le composant SwissDecTX est un transmetteur de données salariales SwissDec prêt à l'emploi. En bref, vous créez le document XML contenant les données salariales et la librairie SwissDecTX se charge de le valider puis de le transmettre au serveur sécurisé en respectant toutes les exigences et normes en vigueur, par ailleurs très élevées, imposées par l'administration. Cette partie technique ne demande que quelques lignes de code et pratiquement tous les langages et environnements de développement sous Windows, très anciens ou très modernes, sont supportés d'une façon ou d'une autre et de manière vraiment très simple. Il nous est possible de créer des version 64-bit des divers composants si necessaire, contactez nous pour en discuter. Nous avons des utilisateurs sous Progress, WinDev, VB, Access et Delphi pour l'instant, utilisant tous exactement la même version du transmetteur. Une fois les données salariales créées au format requis, l’épineux problème de l’envoi signé et crypté est maintenant entièrement résolu (tout comme les problèmes de communications HTTP, HTTPS, la gestion des proxy en environnement d'entreprise etc) ! Vous gagnez un temps fou et vous pourrez faire certifier votre produit nettement plus facilement, sachant que cette partie technique très difficile à réaliser est parfaitement gérée. L’intégration de SwissDecTX peut se faire littéralement le jour même et si vos données de déclarations salariales sont complètes et votre XML conforme aux spécifications, vous transmettrez vos fichiers sans le moindre effort, probablement au premier essai car notre produit est pré-testé, en fait il fonctionne déjà parfaitement et peut être utilisé et intégré de suite. Nous avons fait des milliers d'envois sécurisés sur les serveurs de tests "itServe" sans aucune erreur. A titre d'exemple voici le message correspondant à l'envoi du fichier de référence ICHAGCompany.xml (utiliser la commande View Source car IE à des soucis avec les lignes vraiment très longues), et voici la réponse correspondante et le statut, confirmant que le serveur a accepté la déclaration (en dépit du fait que les données de références sont quelque peu périmées). Nous sommes en mesure d'envoyer imediatement des données sur les serveurs de test. Envoyez-nous votre monitoring ID et vous constaterez vous-même le résultat sur votre propre compte-test SwissDec! SwissDecTX peut être redistribué en tant que partie intégrante de votre application, la licence de SwissDecTX est « par projet et par société de développement » et comprend un droit de redistribution illimité dans le cadre de votre produit, le coût est donc fixe, sans « royalties », vous obtenez simplement une licence SwissDecTX pour le produit X de la société Z. Le prix de vente inclut un SUPPORT COMPLET pour l'intégration du transmetteur dans votre application salariale, ainsi qu'un plan de maintenance d'une durée d'un an à compter de la date d'achat, comprenant toutes les mises-à-jours et éventuelles corrections. Pour la suite, nous offrons également un plan de maintenance annuel avantageux, qui comprend toutes les mises à jour et un support étendu, vous profiterez ainsi automatiquement des évolutions futures. Le code-source peut être mis à disposition à fins d'archivage, dans le cadre d'une license séparée. Neuf sociétés de développement d'applications salariales (dont deux en Suisse alémanique, cinq en Suisse romande et deux au Tessin) on désormais obtenu la certification SwissDec officielle de leur produit salarial au moyen du transmetteur SwissDexTX depuis le 7 sept 2009. Le transmetteur SwissDecTX est un produit éprouvé et maintenant déployé en production dans plusieurs centaines d'entreprises Suisses, transmettant collectivement des milliers de déclarations salariales chaque année. Posez la question à votre expert SUVA local: il y a toutes les chances qu'il ait entendu parler de notre produit, voir qu'il ait déjà certifié une ou plusieurs comptabilités salariales incluant notre transmetteur SwissDecTX ! Voici une présentation en format PowerPoint ou PDF ainsi qu'un Guide d'Intégration en français et un fichier d'aide (CHM - sauvegardez ce fichier sur votre ordinateur et "débloquez-le", car il ne peut pas être ouvert par (ou depuis) un navigateur web). SwissDecTX est un composant léger et sans histoires: il suffit d'ajouter un petit installateur d'environ 1.5MB à votre application et c'est tout! Le déploiement sur l'ordinateur de l'utilisateur final est géré entièrement par la routine d'installation fournie !